At a pool in Espoo, near Finland’s capital Helsinki, Maija Mottonen is teaching adults to swim like mermaids in a class that combines fantasy with fitness. Since August, more than 200 women and men have attended the classes run by Mottonen, a former kindergarten teacher who is Finland’s first professional mermaid instructor. 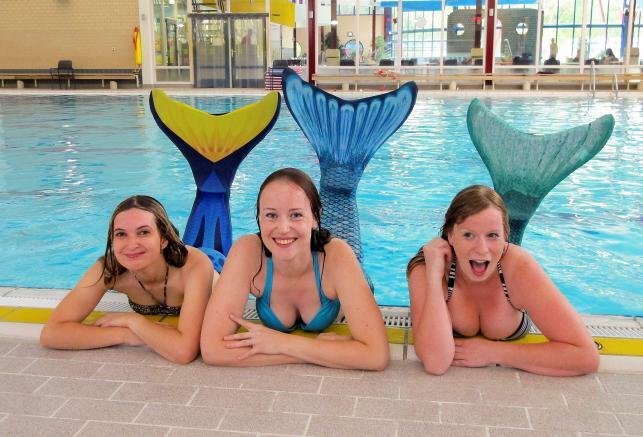 Would-be mermaids and mermen wear “tails” that combine a monofin flipper with fabric from the waist down. “It’s kind of magical,” said construction worker Markus Parviainen, 29, describing the feeling of diving with the green tail he bought online for 170 euros ($195). Parviainen, who also enjoys cheerleading, said his new hobby was a good way of keeping fit, but acknowledged it had raised some eyebrows among his co-workers. “People think, or mostly men, are thinking that this is only for girls or women. But I disagree, this is for everyone ... as long as you love swimming,” he added. Mottonen, whose own tail is bright pink, teaches her pupils how to undulate their entire body from head to toe, “like a snake” as she describes it, followed by a dolphin kick with the monofin flipper to move forward. More experienced students like Parviainen practise tricks such as flapping their tail on the surface while hanging with their head down underwater. “When I had tried this once, I was hooked. I feel real powerful in water,” said Annika Ihatsu, who had driven for 40 minutes on icy roads from her home in Hyvinkaa to attend the class. While few people would want to make a splash during the cold Finnish winter, instructor Mottonen said the country’s roughly 180,000 lakes were better for mermaiding in summertime than beaches with salty seawater that would make her tail float. “We have a lot of lakes so it’s easy in summer,” she said. “It’s my childhood dream-come-true,” the 28-year-old told Reuters.